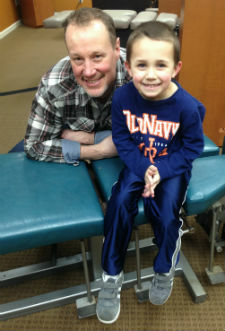 Young or old, we enjoy helping all of our patients heal. Since 1998, Dr. Scott Stachelek has been welcoming those in Montclair and Manassas to experience exceptional wellness. Named after the Marine Corps and core wellness concept, True North Chiropractic, has evolved into a watering hole for wellness. This vision represents our office culture as a gathering place where everyone is welcome. The watering hole in biblical times was the community well and also a place where people gathered to be nourished physically, socially, emotionally and as it turned out, spiritually. Our friendly staff will welcome you and your family. We’ve created an environment that symbolizes a modern watering hole. True North Chiropractic is a place where families want to be here and hang out, where moms can relate to others, and where kids can be kids. We embrace children across the autism and ADD spectrum. We welcome you if you’re running behind, and offer convenient care. It’s not just about your back pain or neck pain, sensory disorders, or injuries on or off the field. True wellness encompasses incredible health so you can do the things you’re passionate about. We’ll talk to you about what you love to do and what things you won’t be able to do if your pain persists. Whether your goal is to run, hunt, boat or live without pain, we’ll work to help you recover so you can get back to doing the things you love. Here, everyone is welcome, and we encourage you to discover what lies ahead in your journey. Rest assured that our values are dedicated to helping you live your greatest life. Our Strategy: Teach, celebrate and model the rewards of a life lived through a subluxation-free nervous system by connecting our members to their passions, to science and to each other. Our Purpose: Leading families into a life where exceptional wellness is the norm. Our Mission: To create a values-driven community united by a commitment to help our patients achieve their highest potential. 1. A healing environment. True North Chiropractic features an atmosphere where people want to come and look forward to visiting. We have created a community where people are united by their commitment to achieving their highest and deepest health values. Ours is a culture that weaves people in rather than one that weeds people out. 2. Science-based care. We’re neurologically driven geeks that focus on educating you and teaching you exactly what is going on and exactly how we are going to achieve your highest health goals. We always measure and test. We use state-of-the art diagnostics (The Insight Millennium) to assess and track your progress. 3. A team that walks the walk. Our entire team models optimal nervous system function as health and wellness is our lifestyle. Together, we uphold our principles of health as we help you uphold yours. If you’re wondering how our care can help you transform your life, speak with us today and let’s set up a time to talk about your health goals!